Mattress design and construction have come a long way in the last 20 years. We no longer rely on just springs and foam to provide the level of support we need. Thanks to new materials and an awareness of the many different sizes and shapes of sleepers, we are able to customize our nightly sleep experience to levels we couldn’t even imagine just a decade back. One such area of specialization concerns a mattress suitable for heavier customers. Going beyond the considerations for side, back or restless sleepers, the needs for a heavier sleeper will be different than for a thinner person. A mattress is an investment, and when it turns out to be too soft, begins sagging, or develops low areas, it is not only uncomfortable but expensive. In our reviews, we will consider the special needs of a larger person, and also consider how different sleeping styles and needs are important when choosing the best mattress. For the purposes of this review, we will consider that what constitutes a heavy sleeper is relative. Dependent upon one’s height, overweight for one person might be 160 pounds – for another, 260. 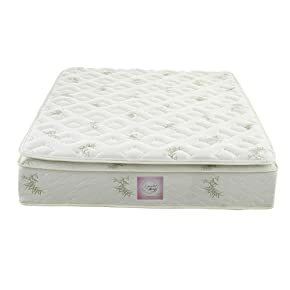 That said, we’ll look at mattresses that are the most suitable and comfortable for a consumer who is over 275 pounds. Each of these mattresses will be supportive for a sleeper of at least that weight. We will also look at mattresses that are best suited for two sleepers, as well as other needs, such as your sleeping style (side, back, etc.) and type of use. The structural elements that apply to the specifics of what a larger person needs for support and comfort are just as important. Thickness – Heavier sleepers need more support. There is more pressure on the mattress, and the support must be there. With a thicker mattress of 12″ or more in depth, the layers will not give too much or be flattened. We will compare and note the thickness of each mattress. Springs or foam – While some manufacturers have gone to all-foam construction for their layers, some still use individually pocketed springs. The advantage here is the ability to isolate movement when more than one person is sleeping – and, well – springiness. It’s personal preference, but you may simply like the feel of a bit more bounce in your sleeping surface, especially if you’ve been used to this style in the past. Firmness – Larger sleepers will depress the mattress 1-2″ more, on the average. A mattress that should be the most comfortable would be considered medium-firm to firm. Side sleepers will prefer a slightly less firm mattress that provides a bit of cradling support between the shoulders, hips, and knees that support the most weight, while back sleepers will usually find a firmer mattress more comfortable. We will look at the firmness of each mattress reviewed. Coolness – More mass creates more heat on the supporting mattress as we sleep. 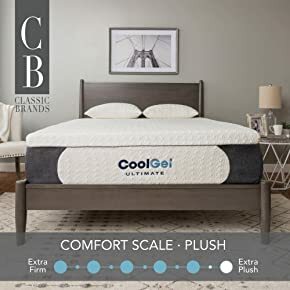 A common “must have” for selecting a mattress in larger sleepers is coolness. This can be addressed by the new materials available. Mattresses utilizing gel in their construction are able to disperse heat better. We will review mattress material and identify products that help you have a cooler night, every night. Please read ahead to find out our suggestions for couples, vacation homes and guest rooms, and other applications. one of our products will be perfect for your own circumstances. This mattress gives a somewhat softer profile, perfect for those who sleep on their sides. Side sleepers need a mattress that provides a cradling effect, while still supporting the back and vertebra. The main pressure points will normally be the hips, shoulders, and knees. 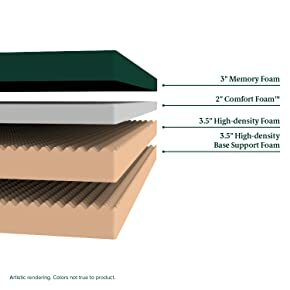 At 12 inches, this Zinus mattress provides the thickness required for heavier sleepers, while the memory foam is just the right combination of support and softness needed for side sleepers. This manufacturer has also used plant materials, including green tea, in their “BioFoam’. If you are looking for a more eco-sensitive approach to mattress-buying, this is a good product to consider. The mattress is all-foam but is made of 4 layers. A base layer for the firm support needed is topped by comfort foam, and the top two layers are made of memory foam. All the memory foam used is infused with green tea for freshness, and all the foam is Centri-Pur certified for low emissions and odor when decompressing. reviewers noted that the reinforced edges hold up well, especially for the reasonable price. The manufacturer notes that this mattress can take up to a week to completely decompress. You will need to be able to unbox it soon after it arrives, otherwise there could be lingering issues, such as dents, from the extended time rolled up in the box. Unlike some of the other mattresses, this is not gel-infused, and may not be cool enough for those who tend to sleep “hot”. Could take up to 7 days to fully decompress. This is a premium mattress with a price that hits the high end of the range of mattresses reviewed. That said, it is an excellent choice for heavier sleepers over 300 pounds. With 5 separate foam layers and a depth of 14 inches, it provides support and less compression. Reviewers for this product rave about how comfortable and supportive it is, even though they themselves are larger sleepers. The Quattro Sleep Master has divided the foam into specific layers. A top memory foam layer is covered by quilted memory foam, for a total of 3.5 inches of pressure-relieving comfort. 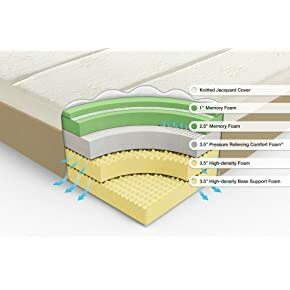 Below this, another layer of memory foam, as well as a layer of airflow foam, provides support. And, beneath all this, lies yet another layer of base support foam, which is high density and resistant to pressure. What all this does for the sleeper is provide a foundation that feels quite plush, even with more weight placed on it. The foam used is CertiPUR-US Certified. This certification is for foam products that have minimal petroleum product ingredients (partially replaced by plant oils in this case) and minimal off-gassing when unwrapped. Their “Bio Foam” uses green tea oil to help keep the foam fresh and reduce odors. The mattress arrives rolled and compacted and will need 48 hours to completely decompress. This mattress has a 10-year warranty and comes with a nice quilted cover that will provide some breathability, but this may not sleep as “cool” as some other mattresses. Nevertheless, this has been rated highly by many sleepers. Weighing in at almost 130 pounds, the mattress will be difficult to install on your bed if you’re doing it alone. Likewise, the depth of this mattress may require some help to maneuver, as well as occasionally turn, as is recommended. The construction of the mattress, while plush, may not be as cool as some other products. This 13-inch mattress gives a lot of nice features for its price. If you are looking for the first mattress for your home or apartment, the Olee Galaxy will allow you to try out a range of features that are suited for heavier sleepers, without breaking the bank. We suggest it for an entry-level purchase at a good price. The Galaxy Hybrid’s design employs both pocket springs and memory foam for a combination that gives the needed support and also isolation of movement. This is achieved by utilizing the individually separated springs for minimizing the “waves” made by active sleepers. The top layers of foam distribute weight. This design also has gel infused into the top foam layer – which gives a better distribution of heat and a cooler mattress. There are 3 layers of foam over the spring foundation, with an additional fiber padded top. It’s a bit of a different feel from all foam construction. Reviewers rate it at as a very solid mattress over time. It holds up well, has little chemical odor, and provides a firm sleeping surface with a bit of bounce, due to the spring base. As we said – if you are trying this type of mattress for the first time after using a set up with box springs, this may be the perfect transition for you. Reviewers have noted that this “inflates” pretty fast compared to the strictly memory foam mattresses. You will need to get this on the bed before you start unwrapping it – and it’s awkward. Although it does have a fabric cover, it is not removable for cleaning. If you are over 300 pounds, you may wish to try a style of mattress with foam layers, only. This design has been updated for 2019 and is made entirely of foam. The manufacturer describes it as a “plush” sleeping surface, and most reviewers agree that it is on the firmer side of our range. Measuring in at 14″ deep, it has 3 layers. 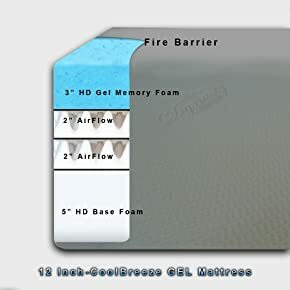 The base support is high-density foam, the middle layer is gel memory foam, and the top layer is 3.5″ of Cool Gel Memory Foam. This has a faster “recovery” time – or it bounces back more quickly than regular memory foam. The thick gel foam layer distributes heat better, which makes it our choice for people who just want a cool night’s sleep. Reviewers noted that the mattress is firmer when first out of the packaging, and softens slightly after a few days of use. A break-in period of about 10 days seems to be average. This would be expected as it continues to decompress. Overall, it is described by reviewers as being a somewhat firmer mattress that is good for back sleepers. A nice bonus that comes with the mattress is two memory foam pillows (standard size) – perfect if you’d also like to try out this type of pillows. The manufacturer suggests that an adjustable bed base works well with this mattress, making a conventional bed frame unnecessary. If you are starting out with a whole new bed set, this is something to consider in your selection. The foam used is also CertiPUR-US certified, which should assure that there will be minimal off-gassing as it expands. It has a 10-year warranty. Might be too firm for side or stomach sleepers. The break-in period described by several reviewers may be more than you wish to deal with. With the motion-isolating qualities of coil springs, this mattress provides the best combination of support for heavier sleepers, as well as the ability to minimize movement across the bed for couples. This Signature Sleep style has not only 13 inches of support, it also has a base with 630 coils that isolate motion and provide consistent firmness. This base is topped by an additional 3 inches of memory foam. The individual coils are also separately encased. 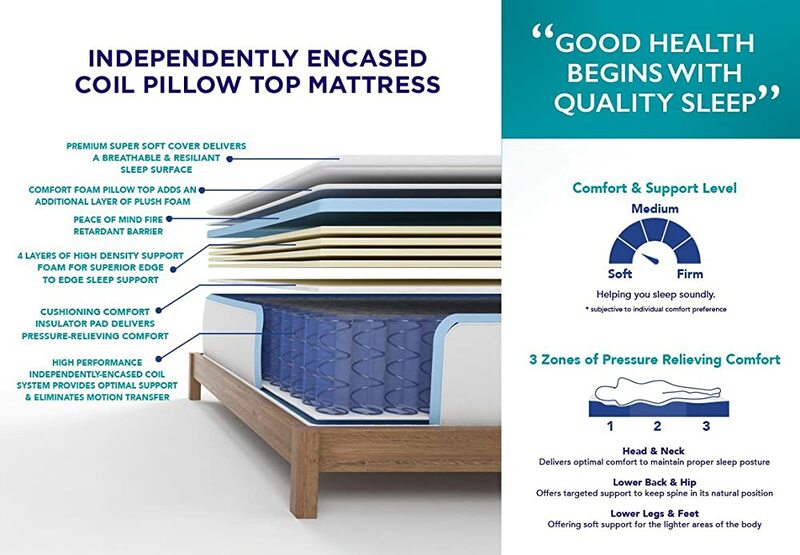 This combination provides the firmer support you would expect from a more ‘traditional’ mattress, while the foam distributes stress evenly and comfortably. As with the other mattresses, this unit arrives rolled up and compressed even with the springs! For decompression time, expect about 24 hours. Because this uses memory foam only in the top cushioning layer, there will be minimal off-gassing involved. Even with that, the foam used is Certipur-US Certified. The top is quilted. Some reviewers note that they maintain the resiliency of the surface by rotating it regularly. Unlike conventional spring mattresses, this style cannot be flipped. Better for back sleepers, due to the firmness. Works best with regular rotation. A more conventional feel than foam-only mattresses. 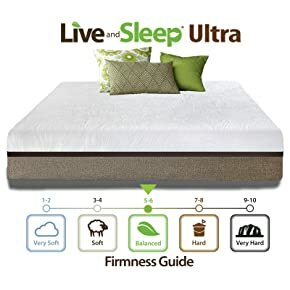 This unit provides high-quality features like reinforced rounded edges, a medium-firm sleeping surface, heat-dispersing gel blended into the foam layers. a good foam base layer, deep-but-not-too-deep thickness, and a good guarantee. the price is mid-range, and it can be used with or without a base unit. This mattress has all-foam construction. The support base is 8.5 inches, with an additional two layers of air-flow foam and of heat-dispersing gel foam. The firmness is rated as medium-firm, which should be comfortable for side sleepers and many back sleepers. Reviewers with various physical issues found it to be comfortable and supportive. The top cover is removable linen and can be laundered, which is a nice feature not found in all of the mattresses we reviewed. The decompression time seems to run about 24 hours, and since the mattress is made of Low-Emission materials, the lingering smells from off-gassing are minimal. More than others, reviewers mentioned that there seems to be a bit of a “break-in” period with the mattress. This could be due to the foam continuing to decompress, or simply individuals adapting to the more supportive foam sleeping surface – either way, we recommend giving yourself a few days to get used to this mattress style. Some other nice features of this particular mattress are a bonus pillow (Queen sized), a 30-day trial period, and a 20-year warranty. It can be used alone or on ay kind of base, including your existing box springs. All in all, a nice blend of features for anyone considering this type of mattress. The base support needs to be closely spaced for best performance, requiring a bit of additional research or shopping. A couple of reviewers have mentioned seams torn or split upon arrival. This is a firmer mattress, perfect for the combination of a heavy sleeper who also sleeps on their back. Measuring at 12 inches, the Cool Breeze model combines a thick 5-inch base layer with 7 inches of memory foam atop – giving the firm support needed for heavy sleepers, as well as the memory foam support that adapts well for back sleepers. Reviewers rave about the overall comfort of this mattress. It has other nice features like a removable, washable cover with reinforced corners, and two bonus memory foam pillows. It’s gel-infused – the heat-dispersing qualities of the gel provide a cooler night’s sleep for anyone who tends to swelter no matter what the room temperature. The bonus pillows are just the right firmest for back sleepers, making this our top choice for this sleep style. Reviewers really liked the looks of the removable cover. It has brown suede-like accents that hold up well and don’t show dirt. Also mentioned frequently was how very cool and comfortable the Cool Breeze was for sleeping – it really lived up to its name. The odor is minimal, due to the Centri-Pur certified foam used. As the others, it will arrive rolled and compressed, and the decompression time is average. Allow at least 48 hours before making any final decisions on the firmness of the mattress. As with other deep mattresses, you may have to purchase new sheets, if you’re upgrading to a thicker mattress. Gel Mattresses can feel too cool for some. If you’re not a hot sleeper, you might consider a similar product without the infused gel. As with other all-foam mattresses, be prepared to rotate it regularly to maintain the quality of the support. This is not a one-person job. For a guest room or vacation home, a combination of features that will suit the widest variety of sleeping styles, while minding the budget, is ideal. This Lucid Hybrid Mattress has components that will make it perfect for your guests or holiday visits. Measuring in at 12 inches, it will not require ultra-deep pocket sheets or extra expenditure in that area. It can be shipped or transported to your vacation home in its original packaging, as it arrives rolled and condensed. 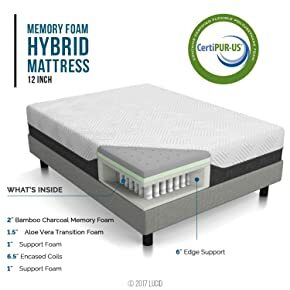 This is the only product reviewed that uses both bamboo charcoal and aloe vera gels that are infused into the memory foam layers. The manufacturer recommends these to combat odors, disperse heat, and to provide a fresh experience. These same qualities are ideal in a less-frequently used guest room or second home, which may need an occasional airing out before being used. As for keeping a wide range of sleeping styles content, this unit is a hybrid, as the name indicates, and should perform well. A base layer of individually wrapped coils will isolate movement between sleepers while providing adequate support for heavier sleepers. The next layer is composed of a transition layer to spread out support. The top layer is the one infused with bamboo charcoal gel, providing a cooler sleeping experience and a softer sleeping surface that some of the firmer products reviewed here. Side sleepers will feel supported and cradled, while back sleepers will get the firmer feel of support that the traditional spring-based bottom layer provides. The whole thing is topped off with a knit fabric cover. The unit uses less foam, so there is less off-gassing involved, and reviewers had great things to say about the cool sleeping experience it provided. It also needs less decompression time, as there is less foam involved in the construction. It has a 10-year warranty. As with all these mattresses, you will need an assistant to unbox it and get it on the bed. Some reviewers rated the surface as too soft. Rotation of the mattress is recommended to maintain it. This is a two-person operation. Q: I tried out a memory foam mattress at my mom's house. It was hot and uncomfortable, but I liked the support. How do I get around that? A: Look at our suggestions for gel-infused foam mattresses. These help disperse the heat and keep you cool. Multi-layered mattresses often have elements that help increase air flow. Q: Is my memory foam mattress going to explode when I unwrap it? A: All the mattresses we reviewed arrive compressed, but there won’t be a dramatic explosion, like a life raft. They will take, at the minimum, a few hours to reach their regular height. You might be able to watch it happen, but it won’t be in seconds. Q: Can I put this on my bed by myself? A: It’s better to have a helper, but if you must do it alone, be sure to get the mattress on the bed frame before you open the final wrap. It will then unroll and decompress in place. it’s much easier to move the rolled mattress than the unrolled one. Q: Will I need new sheets? A: We’ve listed the heights of each mattress reviewed. Some of the thicker ones may require new sheets, even if you already own ‘Deep Pocket” style sheets. It’s best to check measurements versus your current sheets. Heavier or larger sleepers have specialized needs that have, in recent years, been addressed by improvements in the design of mattresses. 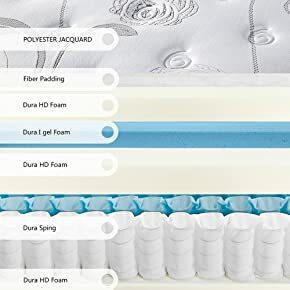 As there is additional pressure on the bottom layers of the mattress, it needs to be both thicker and more capable of withstanding and recovering from deep compression. A minimum depth of 12 inches is recommended for any heavier sleeper. Once the deep support and depth requirements are satisfied, your specific needs should be addressed. Your sleeping “style” (side, back, etc.) requires a more customized support. Side sleepers will sleep best with a more cushioned top surface that both cradles and supports the body while relieving pressure on the hips and shoulders. Back sleepers will be happiest with a firmer mattress. Those who get warm in bed with find mattresses to suit them, while couples can also find a mixture of features that will keep the bed still when one person tends to move a lot in their sleep. Finally, the actual construction of the mattress should be considered. With common issues being breakdowns of support that show up as sags, bumps, or troughs, it’s important to look at mattresses with materials that will hold up and maintain your investment.